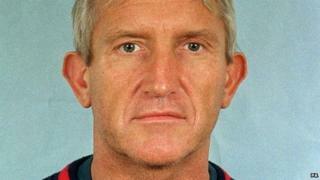 One of Britain's most notorious criminals, Kenneth Noye, has been given the chance to argue for his release from prison at a parole hearing. Noye, who is now 67, is serving life for a road rage murder. He stabbed 21-year-old Stephen Cameron to death on an M25 slip road in Kent in 1996 and then fled the country. He was eventually tracked down in Spain and extradited two years later. At his trial he admitted wielding the knife but claimed he had acted in self-defence in a fight with Mr Cameron. The jury found him guilty of murder by a majority of 11-1. He lost appeals against his conviction in 2001 and 2011. Noye revelled in his image of a rags-to-riches businessman. But his luxury lifestyle was funded by crime, including his role in Britain's biggest robbery - Brink's-Mat in 1983. He was born in Bexleyheath in south-east London. His father ran a post office and his mother managed a dog-racing track. He left school at 15 with a prodigious work ethic and was proud to have several jobs at once. He started delivering newspapers and milk, helping in shops, selling programmes at greyhound tracks and also had a spell as a newspaper vendor in central London. But he was tempted by crime at an early age and was jailed for receiving stolen cars. At the age of 23 he married Brenda, an engineer's daughter, and trained as a process artist in the print trade. In the 1970s he worked night shifts in Fleet Street. However, he soon tired of working for others and decided to go it alone, setting up a haulage company in a run-down caravan behind a garage in West Kingsdown, Kent. He then went into the building trade, and then property - most noticeably making a £300,000 profit from a US trailer park. Noye again ran foul of the law in 1977 when he was given an 18-month suspended sentence for receiving and possessing a shotgun. Even so his business prospered. In 1980 Noye built a 10-bedroom mock-Tudor mansion on 20 acres of land near West Kingsdown. He also bought a villa in northern Cyprus and a £700,000 yacht. Then on 26 November 1983, six gunmen burst into the Brink's-Mat warehouse near London's Heathrow Airport. They doused security guards in petrol and threatened to set them on fire before escaping with a fortune in precious metal, jewels and cash. The Brink's-Mat bullion robbers took 6,800 gold bars weighing three tonnes, platinum, diamonds and travellers cheques. The haul was valued at £26.3m. As detectives hunted the gang, the gold was melted down and sold. The following February, Anthony Black, a security guard "mole", was sentenced to six years at the Old Bailey - the net was closing on the robbers. In December 1984 two of the gang were convicted and given 25-year terms. A third accused man was cleared. Suspicion was also falling on Noye. That year to he flew to Jersey with a bag containing £50,000 in £50 notes. He also bought 11 gold bars from a bank, took them away in a shopping bag and deposited them in a safe. Then in January 1985 John Fordham, a Scotland Yard detective investigating the Brink's-Mat robbery, was stabbed to death in the grounds of Noye's West Kingsdown home. Eleven gold bars were found hidden around the premises. Noye was charged with murdering Mr Fordham. But the jury at his trial cleared him on a majority verdict, deciding that he had acted in self-defence. He was back in court in 1986 and, after an 11-week trial at the Old Bailey, was convicted of conspiring to handle gold from the Brink's-Mat robbery and conspiring to evade VAT payments. "I hope you all die of cancer," he shouted at the jury. Noye was sentenced to 14 years and fined £500,000 plus £200,000 costs. On his release in 1994 Noye returned home and managed to keep a low profile for two years until his name, and face, was once again on the front of the nation's tabloids in connection with the M25 murder. The prosecution suggested at his trial that Noye's fiery temper and his injured pride were ultimately his downfall. Taking a hiding from a younger man was too much for him to cope with and he reacted by knifing Mr Cameron to death. He was arrested in Spain in 1998, and was extradited to Britain for the murder trial of Mr Cameron. He was convicted in 2000. He appealed against his conviction but the Court of Appeal dismissed his appeal the following year. Noye launched his appeal in 2001 on the grounds that eyewitness Alan Decabral had a criminal background and had lied in the witness box. Mr Decabral, 40, from Pluckley in Kent, was shot dead in October 2000, six months after Noye's trial. His killer has not been found and the case remains open. Noye first applied to the Criminal Case Review Commission for a review of his conviction in 2003. In 2006 the Commission decided not to refer his case to the Court of Appeal. But two years later the High Court granted Noye permission to seek a judicial review of the commission's decision. The commission agreed to reconsider Noye's application in April 2008. It then referred the conviction to the Court of Appeal after a lengthy re-examination of the case, which has included consideration of the pathology evidence at the original trial and new expert evidence not available at the time of the 2006 decision not to refer the case. Noye's lawyers argued that key prosecution witnesses at the trial were now "so discredited" that his conviction should be quashed. Giving judgement, Lord Judge, sitting with Mr Justice Henriques and Mr Justice Davis, said there was no doubt that Mr Cameron was "deliberately stabbed" by Noye, and that it "was not self-defence".